GearGems.com » It’s Not a Violin, Dammit! Ever renounce your Violist Pride at the airline check-in gate? Better that than to have them put your viola in the cargo hold, or worse, make you buy it a ticket of its own! Small print on our It’s Not a Violin, Dammit! 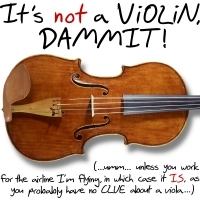 design reads “…umm.. unless you work for the airline I’m flying, in which case it IS, as you probably have no clue about a Viola!” Can you relate? We’re sure that anyone who has ever flown with their viola is nodding in sympathy! Buy this design now on any t-shirt or apparel, tote bag, mousepad, mug or other quality giftware item, exclusively from Bratsche’s Viola Bazaar!